This is the time of year, the transition between Winter and Spring, when most people find their skin starts to suffer. The sunlight hours are really short, the weather is cold and the central heating is always on max. All of these factors mean that perhaps a little treat is in order. 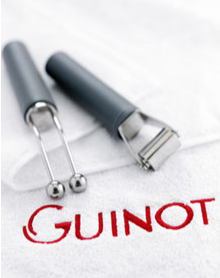 Whenever anyone asks what I recommend for tired, de-hydrated skin that has broken out I will always say have a Guinot-Hydradermie facial. It is magical! So, Yep, this looks a little scary and when I tell you these metal rollers have an electric current running through them don't be alarmed! 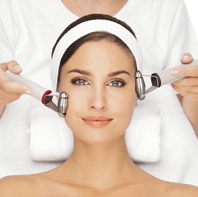 The facial is a mix of manual massage, personalised plant extract oils and a mid galvanic current. It typically lasts about and hour and twenty minutes (of pure unadulterated bliss) and is designed to minimise fine lines, lift and tone the skin, reduce redness, get rid of blemishes and improve radiance. It is great for all skin types and all ages, and gives a really noticeable boost no matter what state your skin may be in. There are quite a few different steps to this facial, cleansing, oil based massage, exfoliation, and extraction all alongside the electric current processes. The rollers are designed to oxygenate the skin and encourage any impurities out, with bacteria being killed off using a slightly different electric current (which is totally painless, the only thing I notice is a funny metallic taste in my mouth but apparently thats perfectly normal). This facial is a really good one to have before a special occasion as it gives the skin a real radiance boost but thanks to the electricity you rarely suffer any breakouts afterwards, Amazing. It's not a particularly cheap treatment, I think it averages around £65.00 ($103.00) and it is recommended every time the season changes. If you fancy treating your skin, or cheering someone up this is a sure fire way to go about it. I love this treatment and I know you will too. If you do have one (lucky you) be sure to let me know what you think of it. i have heard so many great things about this but am yet to try it out! i am such a ninny when it comes to my skin! i should really give it a bash! interesting-I've never heard of this-I think I should check it out.